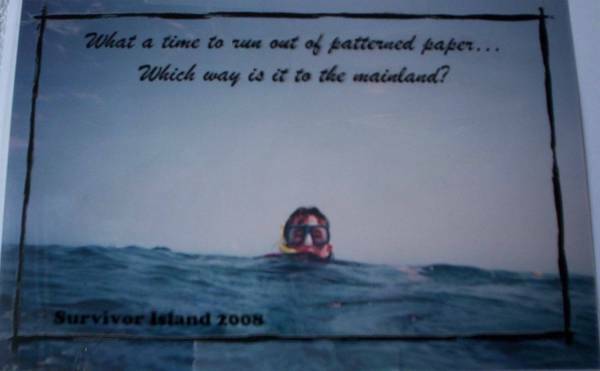 Chook Scraps Scrapbook Gallery - Postcard - Which way is the mainland? Postcard - Which way is the mainland? Thanks to my DH for reminding me about the photos from our holiday in north Queensland (many years ago now) where we went out for a day trip to the reef. And no, I don't think I've been snorkelling since! Bring us back some Stamps, while you're on the mainland Joey Great postcard. LOL.. terrific idea and it looks great! Great photo! Your postcard looks terrific!! Bahahaha! Hilarious, I love it. Hee - hee. This was me the other day!! LOL ... you might need to grab some more supplies for the bar too, I think we might be running low!